Saltwater fly fishing is some of the most demanding angling on the planet. The Sage SALT HD is designed to meet that demand and exceed your expectations. The Sage SALT HD features Sage�s KonneticHD technology, along with many other upgrades and benefits. Saltwater fishing requires quick shots and even quicker second shots, so Sage created a rod that you can rely on when the decisive moment arrives. At the forefront of that reliability is Sage�s KonneticHD technology in the SALT HD fly rod. It is Sage�s optimization of graphite-to-resin ratio, which has resulted in higher density (HD) fibers which means more lightweight, stronger blanks with unmatched energy transfer and line control. It is Konnetic Technology 2.0; better, Higher-Density materials. In fact, it has the highest sectional density of any graphite fly rod. Konnetic Technology is Sage�s way of precisely positioning Carbon fibers in their fly rod blanks to create a slimmer profile and a more efficient energy transfer through the rod. In other words, when you cast a �non-konnetic� fly rod, the blank will not only move back and forth, but also side to side. This is due to the placement of the fibers within the blank; if the rod is moving side to side during a cast, and not just forward and backward, you are losing energy, therefore being less efficient, and your accuracy and distance suffer. Konnetic Technology lays carbon fibers alongside one another in a straight line down the fly rod, so side-to-side movements are significantly decreased. Another noticeable benefit of this fly rod is its pulling power. 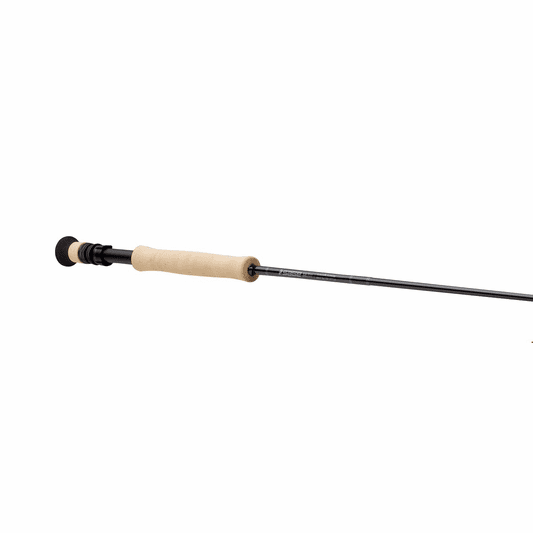 You will notice you get way more pulling force with this rod than with a standard fast action rod, which gives you an upper hand when fighting large fish. Increased line lifting power also gives you a ton of range when picking up large amounts of line for a second cast. The guides are also larger on this rod to allow bulky saltwater knots seamless transportation out of the rod. The slim blank design cuts through the wind efficiently and the lightweight blank reduces arm fatigue. However, we at the Caddis Fly Shop feel the most impressive aspect of this line of fly rods is how each rod in this series is finely tuned for specific saltwater applications. Oversized fuji ceramic stripper guides, oversized hard chromed snake guides, durable anodized aluminum reel seat, super plus full-wells cork handle, all finished off in a sleek squid ink blank color. Each SALT HD fly rod comes with a blue powder coated aluminum rod tube. Sage Fly Rods are proudly made from start to finish in Bainbridge Island, WA and each Sage Rod passes through 27 pairs of skilled craftsmen hands before they are shipped to us here at the Caddis Fly Shop. All Sage Fly Rods come with a lifetime warranty.